Intra-Africa Airfare routing Cape Town - Johannesburg - Kruger Park - Johannesburg, is additional. 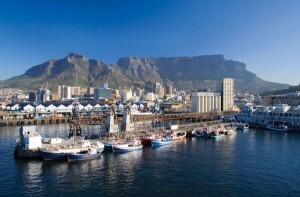 Tour operates upon arrival in Cape Town on a daily basis. Come along on A Taste of South Africa! Spend 4 nights in cosmopolitan Cape Town, voted one of the top destinations in the world, with the opportunity for self-exploration or optional full and half day tours. Continue on an exciting 3 day wildlife adventure at a private luxury Big 5 game reserve with the style and elegance you’d expect of a first rate safari destination. Land from $2,495 per person. Situated in the shadow of Table Mountain and surrounded by pristine white beaches, Cape Town is home to a rich cultural and historical heritage, vibrant restaurants and nightlife and a multitude of activities – from extreme sports to leisurely scenic cruises and world-class shopping. Choose from a variety of optional activities, at additional cost, during your stay in the Cape. How far do you have to travel to find peace and quiet and connect with the simple life? When it’s time to get back to the things that really matter – such as the tranquility of nature, the excitement of culture, and the fascination of history, take a trip tothe Greater Kruger Park. Tempted to see a bit more with our A Taste of South Africa? Think about adding Victoria Falls, Botswana or even an exciting Great White Shark Cage Diving adventure! Embark on your overnight journey to South Africa. Enjoy 4 nights in this wonderful world class mecca for food, history and adventure enthusiasts. Relax and take advantage of the local amenities at your centrally located, vibrant, chic hotel. Add to your Cape Town experience by selecting from our optional full and half day tours (at additional cost). Wing to Kruger Park airport and transfer to your private reserve. Daily game drives allow for close-up encounters with elephants, leopards, rhinos, cheetahs, hippos, as well as a pack of wild dogs (the second rarest African carnivore species, with only an estimated 2000 remaining specimens). Birdwatchers can also look forward to ample sightings of the several hundred bird species typical to the lowveld. After a final morning game drive, wing back to Johannesburg in time to connect with your home-bound international flight. Note: All optional tours are at additional cost. Still longing for more? Consider adding a visit to Victoria Falls or some time at a Mozambique beach resort.